The Wilshire 5000 Total Market Index, a Broad index of U.S. stocks posts biggest drop since 2008, wiping out a big chunk of Americans' savings. NEW YORK (CNNMoney) -- Investors lost a trillion dollars in the stock market Monday as the debt crisis in Europe, lackluster economic news and a downgrade to the U.S. credit rating spark fears of a double-dip recession. The Wilshire 5000 Total Market Index, the broadest index of U.S. stocks, lost 891.93 points, or just over 7%, Monday. This represents a paper loss for the day of approximately $1.0 trillion. Monday is the largest percentage drop for the Index since December 1, 2008 when it fell over 9%. Since July 22, when Republicans abandoned debt negotiations with the White House for the third time that month, the index has lost $2.9 trillion in value. Cynical investors, which could include any of the millions of Americans with pension plans, mutual funds or other retirement accounts, might be tempted to blame squabbling politicians in Washington for much of their ill fate. But experts say it's more complicated than that. "The downgrade has people spooked, but it's not that big of a deal," said Harry Clark, chief executive of Clark Capitol Management. Clark said the prospect of Italy or Spain defaulting on their debt, scant consumer spending and concern about the overall economy are causing the sell off in stocks. "It's just fear, everything together," he said. "It's not just Washington." Clark believes the market is way oversold. "I think it's about had it," he said of the decline. "I'm expecting a big rally out of this." 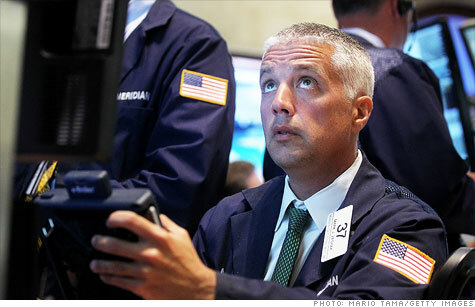 Stocks did rally after the last big sell off following the financial crisis of 2008. The Wilshire Index remains 84%, or $6.9 trillion higher than it was in March 2009. But it's still $4 trillion lower than the market's pre-crisis high in 2007. Jack Ablin, chief investment officer at Harris Private Bank, also said it's unfair to blame the current crop of politicians. "This is the culmination of 60 years of have-it-now policies," he said, referring the deficits Washington has been running for so long. "[The downgrade] would have happened one way or another." Ablin wasn't quite as upbeat as Clark in predicting the next rally, noting that his bank moved 10% of its $60 billion in assets under management into cash last week. "Values are cheap and expectations are low," he said. "But I don't see a catalyst just yet."